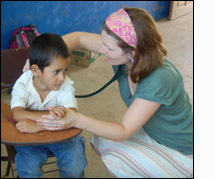 I cram in the back of a pickup truck with two attending physicians, another resident, a physician's assistant, our Nicaraguan guides and boxes of medical supplies. The heavily potholed dirt road eventual leads us to Mongao, a small village in the campo with a two-room health outpost run by a single Nicaraguan nurse. For the next two weeks, I spend my evenings playing with the children of our host family, swimming in the river, talking about the various fruit trees, animals and division of labor on the farm. In the mornings, I ride in the truck to the health outpost and see more patients in a single day's work that I will likely never do back home. The majority of patients are concerned about stomach pain, headache and nighttime cough. In a countryside where people carry heavy 5 gallon buckets on top of their head and cook over an indoor wood burning fire, I am not surprised by their chief complaints. I doubt the envelope of TUMS and acetaminophen, the muscle relations technique and hot rice sock, will cure their aches forever. Maybe the opportunity to have a 'doctora Americana' witness the physically and emotionally demanding way of life will have a more lasting effect. In my work as a family medicine resident I have found the act of listening to be one of the more powerful forms of medicine. We also diagnosed and treated profound anemia, diagnosed occult cancers and helped patient's access further care, and provided prenatal care.